We arrived back in Florence around 8:00 p.m. from our Tuscany tour and were ready for a quick meal and a good night’s sleep because we had to be up early to catch a flight from Florence to Munich, then from Munich into Dubrovnik. We dragged ourselves out of bed at 4:30 a.m. to check out of our hotel. In our half-asleep state, the drive to the airport was a blur. After a two-hour layover in Munich, we boarded our flight to Dubrovnik. 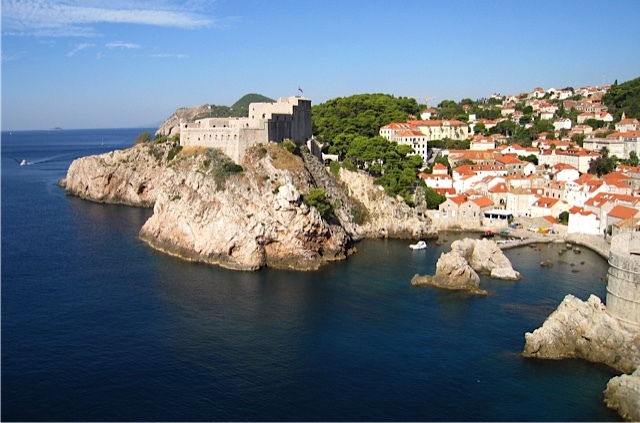 I had no preconceived ideas of what Dubrovnik would look or be like. My only knowledge of the area stemmed from articles I had read, or news reports I had heard about the war-torn area of the 1990s. But I would soon see that the city had recovered from most of the war damage it suffered, and visitors have returned to enjoy this tranquil and beautiful region. We arrived at Čilipi Airport around noon and hurried to the luggage carousel. Dave was eager to collect our roller bags and leave the terminal. From the moment he booked our vacation, he had been giving me glowing reports on Dubrovnik and Budapest and kept telling me I was certain to love both cities. Although this was also his first visit to the region, he had done a lot of research on the area and had heard from friends who had visited that the cities were definitely places we should see. Wheeling our suitcases, we headed straight for the exit, where we were greeted by Nicholas, our driver. We had prearranged for someone familiar with the area to pick us up at the airport. We would be spending our entire visit in the Old Town section of Dubrovnik and therefore had no need for a rental car. We emerged from the terminal to a beautiful, sunny day with a slight, crisp breeze in the air. On the drive from the airport to Old Town, Dave chatted with Nicholas while I admired the scenery. The terrain was rocky and reminded me of certain areas in Arizona, but the rocks and boulders were lighter in color than those of the desert Southwest, and none were red sandstone. I had read that the Adriatic terrain has a karst topography—a landscape formed from rocks of limestone, dolomite, and gypsum, and characterized by underground drainage systems, which limit surface water. In a way, the terrain also reminded me of the landscape around Palm Springs, California. I was pondering this innocuous thought when Dave said, “Well, there it is!” And indeed, there it was—the Adriatic Sea. The placid cobalt surface sparkled under the intense sunlight and looked like a magnificent massive sheet of blue glass embedded with diamonds, stretching as far as the eye could see. 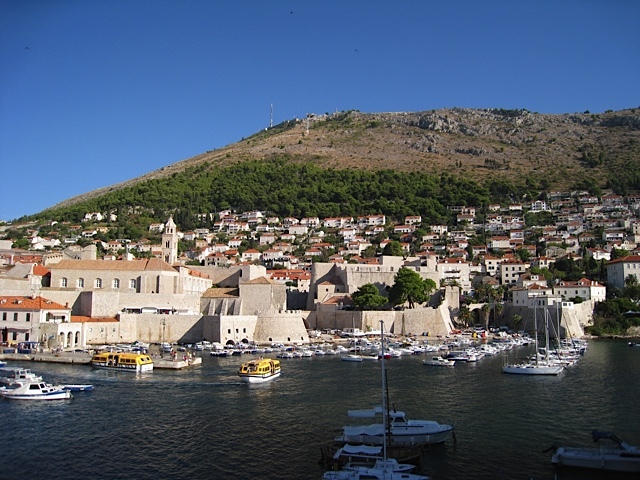 And nestled between the Adriatic and the Dinaric Alps was the seaport of Dubrovnik. Now I knew exactly why Dave had always wanted to visit the city. 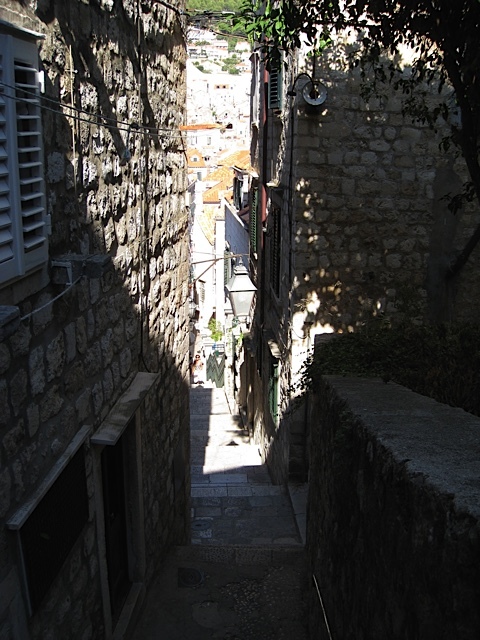 Nicholas dropped us at Ploče Gate, and the walk from there to our accommodations didn’t seem far, until we reached the last few steps. Then we began to feel just how long of a day it had been, especially after we’d climbed the stairs to the apartment we had rented in Old Town. The room was simply furnished, clean, and had a view of a cobblestone alley, with steep steps rising to who knew where. As a writer, I found this seldom-frequented narrow passageway intriguing and couldn’t wait to discover where the lane led. But first, we took a nap to fortify ourselves. An hour later, we rose refreshed, slipped on walking shoes, and set out to explore, beginning our adventure by following the quiet lane alongside our apartment. Halfway up the narrow passage, the grade changed to a steep incline. We hiked it until it dead-ended, or so we thought, but as we neared the city wall the alleyway arched sharply to the left and brought us to a beach access: our first photo opportunity. We spent the rest of the day wandering the city streets, browsing shops, sightseeing, and snapping photos. On our way toward the Stradun, a limestone-paved pedestrian street that runs through Old Town, my thoughts turned to the war. Coincidentally, the day we arrived in Dubrovnik was the twentieth anniversary of the attacks on the city by Yugoslav troops—October 1, 1991. From the street level, we saw few signs of damage from the bombings, but we had yet to walk the walls of the city. This was on the agenda for the following day. From above, I imagined the damage would be more noticeable. I paused to glance in a shop window, my mind still on the war. I thought about a town under siege, tanks and warships shelling this now-tranquil city. Then I heard a most pleasant sound and smiled as the laughter grew louder and closer. A crowd of young children ran by, two dogs trailing them as they raced to the corner of a building and disappeared down a lane. This was what life should be—everyone living in peace. As the day waned and the dinner hour approached, our thoughts turned to food. We ate at an outdoor café on the Stradun, sharing a light meal of grilled vegetables and a seafood salad, washed down with glasses of a local wine. Between bites, we planned our itinerary for the next day and watched the cast of Game of Thrones traipse by, everyone looking tired after a day of shooting on location. 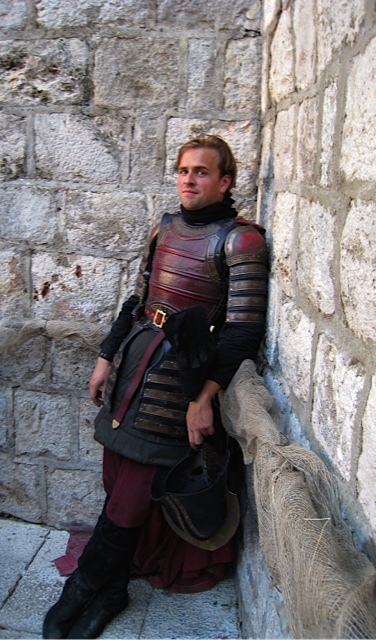 This entry was posted in Travel and tagged Author Pat Krapf, Dubrovnik, Game of Thrones, Game of Thrones cast, Pat Krapf Author, traveling on February 12, 2015 by Pat Krapf.